This is the first (of eleven!) 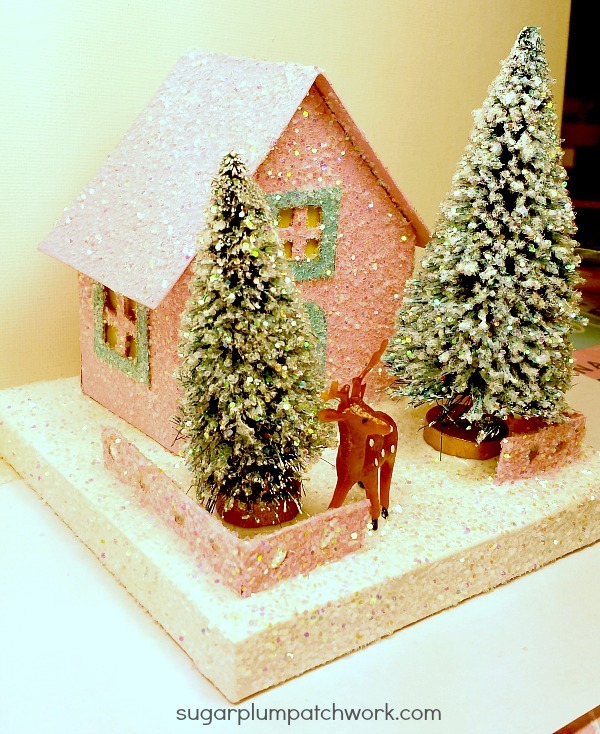 little glitter house I have made and now it's complete - house constructed, painted and glittered, base constructed, painted and glittered and then trees and a little deer added. Ten houses later and I can see that my skills have improved, but this one is special because it's the first. 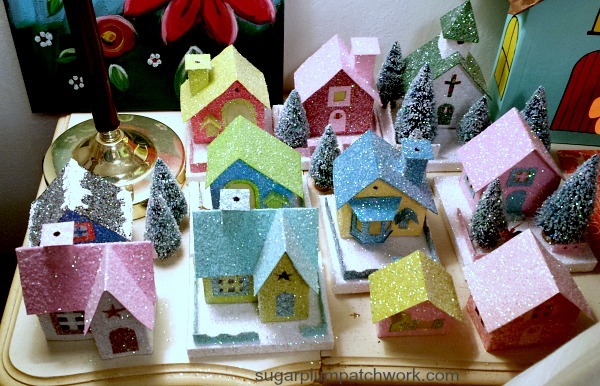 I talked about these glitter houses or putz houses and their history in the previous post. This photo shows more houses waiting to be completed. 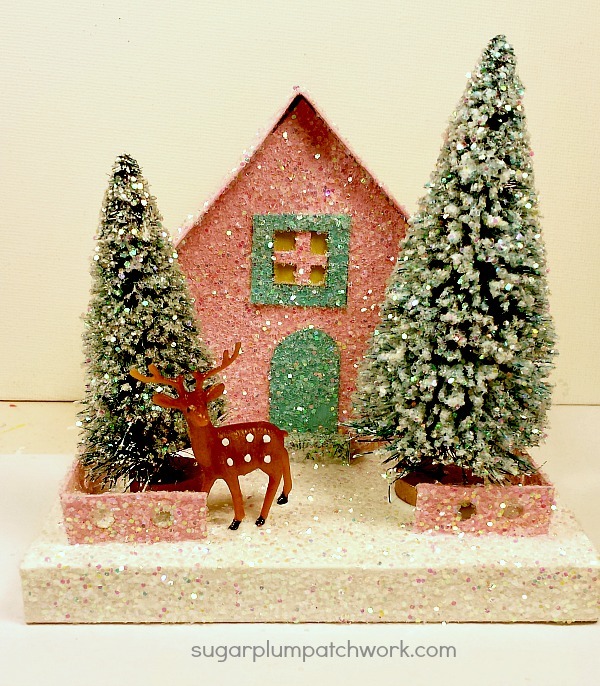 This little house is pink with turquoise blue trim, a pink fence and all covered in glitter. The pattern is by Howard Lamey at Little Glitter Houses. The houses have a hole in the back so you can put a LED light inside to illuminate them at night and see the light glowing in the windows. 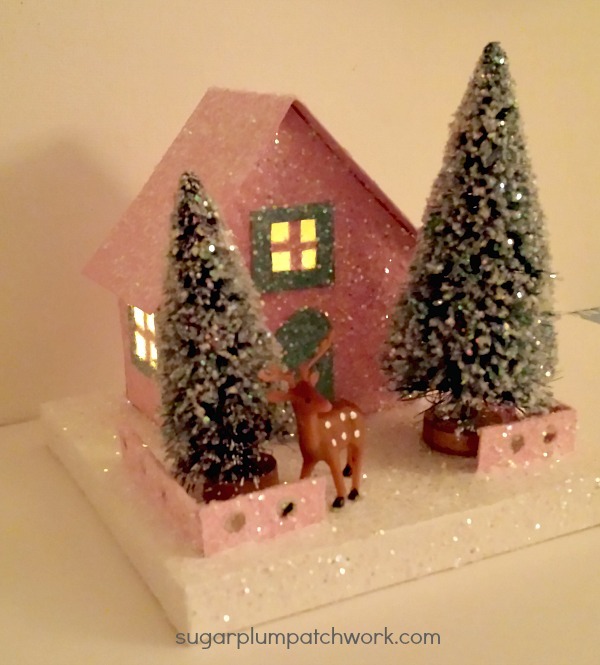 The base is constructed from a tutorial from Rhonda at Christmas Notebook. Doesn't it look like the little deer is listening for Santa?! I hope you are having a creative week - with or without glitter! Linking up with Paint Party Friday. These are absolutley charming!! I love the colors. As kids my family grew up with having a huge putz put up with several running trains about the Christmas village every holiday. A lot of work for my dad but we loved it so. Oh this is adorable, I love the deer. How sweet this is. Oh these are beautiful...Love the vintage deer too...So sweet! OOOOMMMMMGGGOshhh this is amazing. I am so impressed with all the detail. This is truly fabulous. O, I love these colourful houses and the deer! How festive that they can be lit up for the season, too. Fantastic job! Your houses are adorable. I've had them on my want to do list for a few years now. After seeing yours I will/must made a few for Xmas. Can I ask what glitter you use? It's just to sparkly compared to others I've seen used. Great job.